NASA (North American Sommelier Association) is a California founded non-profit networking and educational organization, key member of the WSA (Worldwide Sommelier Association - the biggest umbrella Sommelier organization in the world). NASA was born out of the ‘AIS California’, originally founded in Los Angeles by Professional Sommelier Alessandro Sbrendola (Valentino, L’Orangerie, Bartolotta). As a member of the WSA, NASA exclusively utilizes the renowned and internationally acclaimed WSA curriculum, providing globally recognized education, consulting services, beverage industry services, event creation, professional qualifications, education & certification as well as resale of a wide array of products and literature exclusive to NASA in the North American territory. Certifications emitted by the North American Sommelier Association are recognized throughout the world and made official by the WSA (United States, Canada, Mexico, Chile, Brazil, Peru, Caribbean, Singapore, Japan, South Korea, Slovenia, Russia, Latvia, Czech Republic, Denmark, San Marino, Scandinavia, Belgium, Germany, Italy, France, Switzerland, United Kingdom & Romania). For the majority, NASA possesses its own trademarked course materials, books, study guides and handouts for all its courses. 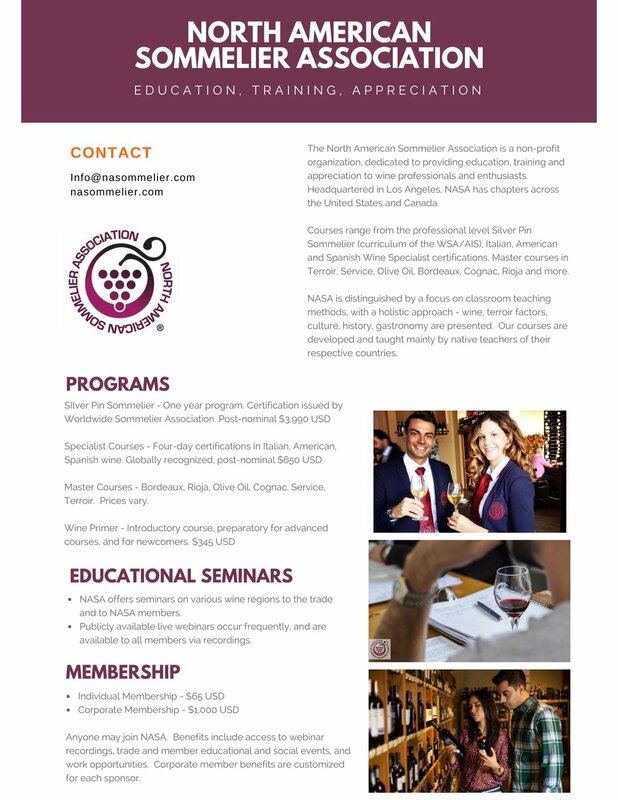 NASA exclusively teaches the WSA 3-phase Certified Sommelier course (Silver-Pin Certified Sommelier) equivalent to the 'advanced' levels of other organizations, plus the extra levels of ‘Master Taster’ and ‘Master of Service’, required to achieve the Gold-Pin Certified Sommelier qualification, equivalent to the top levels with all other educational organizations. The North American Sommelier Association differentiates itself by concentrating on intensive, extensive and in-depth "hands on" class time, with courses and certifications that offer more actual lectures & classroom time than any other association in North America. Focused on "educating" rather than "examining", NASA also distinguishes itself with an exciting, upbeat, hip and intensive associative life, continuously offering seminars, master classes, events, referrals, dinners, networking mixers and educational symposiums to its members throughout the year and across its chapters. NASA’s curriculum, training, experience and heritage embraces the entire world of wine as any Sommelier association should, but prides itself as the highest qualified and quality educator in Italian wine thanks to its close partnership with the Italian Sommelier Association overseas. With an exclusive trademarked diploma of ‘Italian Wine Specialist’ that has achieved remarkable popularity amongst both industry professionals and amateur wine lovers, NASA stands to establish itself as a leading educational & networking entity in the North American wine community. Globally, NASA is part of the WSA, 'World Sommelier Association', the biggest umbrella Sommelier Association in the world, participating at the WSA's international 'Best Sommelier' competition, held in different countries throughout the world on a bi-yearly basis. This cosmopolitan character of our association provides our students and members with international opportunities, contacts and exchanges. Headquartered in Los Angeles, NASA has numerous chapters throughout the United States and Canada. New chapters are constantly opening and we welcome new members no matter where they are based. Along with its sister organizations throughout the world, NASA taps into one of the most active international Sommelier networks. “…to qualify and certify the character and the profession of the ‘Sommelier’. To add value to the culture of wine within the world of food & beverage as a whole, not limited to restaurants and hotels, through every activity from public communication, education, training, events and consulting in this field. The Association is primarily of cultural, didactic and editorial character, for promoting the responsible & educated knowledge and consumption of wine and all alcoholic beverages, with a strong emphasis on gastronomy (food & wine pairing), history and tradition, in order to enhance the quality of life for all. We take direct care of the professional preparation of Sommeliers and hospitality industry staff.”. We do not discriminate. We strongly believe in the social & jovial aspects of wine since it's most ancient inception and we believe the wine & spirits industry is changing, requiring a broader and more upbeat outlook to the profession of Sommelier and the preparation of wine enthusiasts and professionals alike. No matter what walk of life, social, cultural or economical...we stand to train, educate, encourage and promote our members & their personal or professional endeavors.